I have been tasked with installing one of these systems for a sixteen channel bi-directional STL. This system was first mentioned here: The 16 channel bi-directional STL system. As some of you pointed out, the unlicensed 5.8 GHz IP WLAN extension was the weak link in this system. It was not an interference issue, however, which was creating the problems. The problem was with layer two transparency in the TCP/IP stack. Something about those Cambium PTP-250s that the Wheatstone Blade hardware did not like and that created all sorts of noise issues in the audio. We installed the Wheatstone Edge Routers, which took care of the noise issue at the cost of latency. It was decided to go ahead and install a licensed link instead of the license free stuff as a permanent solution. 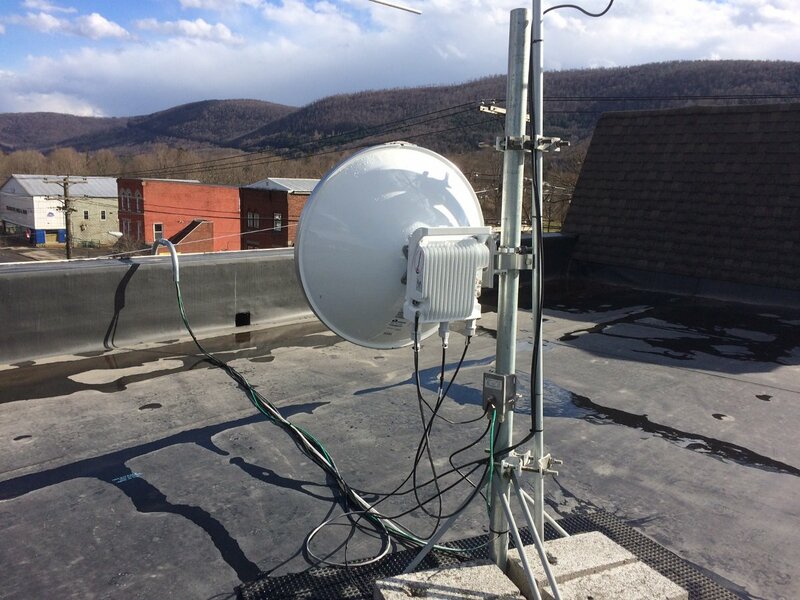 Thus, a Cambium PTP-820S point-to-point microwave system was purchased and licensed. The coordination and licensing took about three months to complete. We also had to make several changes to our network architecture to accommodate the new system. 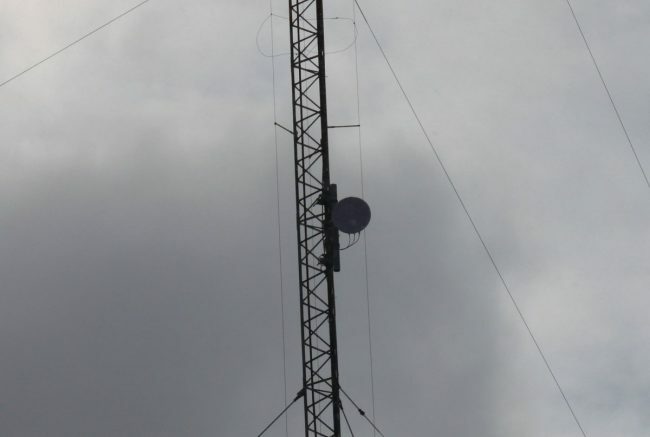 The PTP-820 series has a mast mounted radio head, which is the same as the PTP-250 gear. 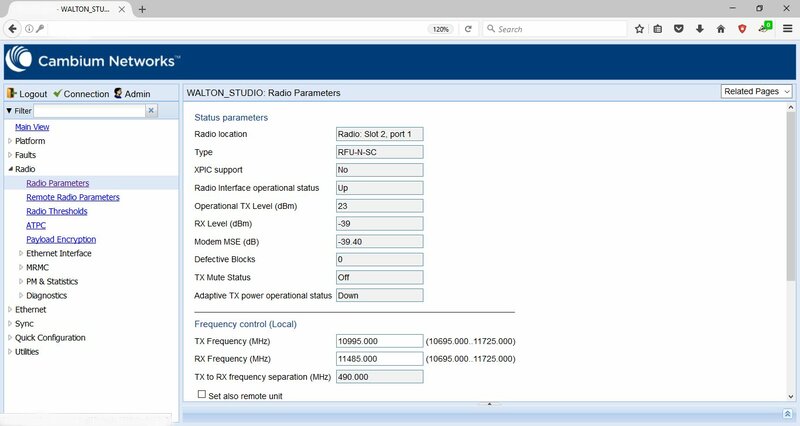 However, for the new system, we used three different ports on the radio to interface with our other equipment instead of the single port PTP-250 system. The first is the power port, which takes 48 VDC via a separate power cable instead of POE. Then there is the traffic port, which which uses Multi-Mode fiber. Finally, there is the management port, which is 1GB Ethernet and the only way to get into the web interface. The traffic port creates a completely transparent Ethernet bridge, thus eliminating all of the layer two problems previously encountered. We needed to install fiber tranceivers in the Cisco 2900 series switches and get those turned up by the IT wizards in the corporate IT department. The radios mount directly to the back of the 24 inch 11 GHz Andrew antenna (VHLP2-11) with a UBR100 interface. The wave guide from the radios is a little bit deceptive looking, but I tried not to over think this too much. I was careful to use the O ring grease and conductive paste exactly where and when specified. In the end, it all seemed to be right. 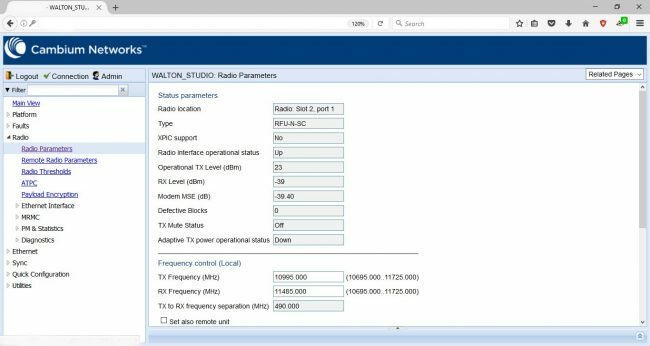 Not wanting to waste time and money, I decided to do a back to back test in the conference room to make sure everything worked right and I had adequately familiarized myself with the ins and outs of the web interface on the Cambium PTP-820 radios. Once that was done, it was time to call the tower company. One side of these are mounted on the studio building roof, which is a leased space. 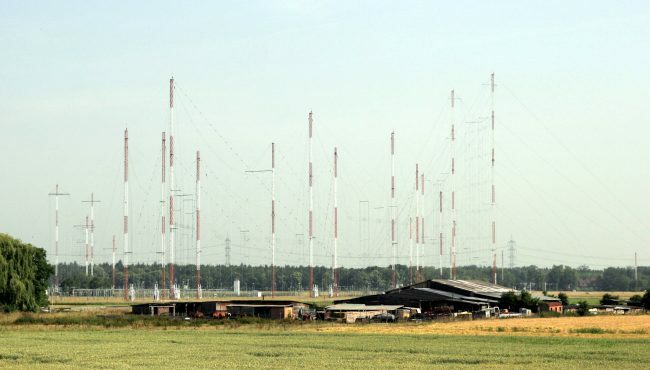 I posted RF warning signs around the antennas because the system ERP is 57.7 dBm, which translates to 590 watts at 11 GHz. I don’t want to fry anybody’s insides, that would be bad. The roof top installation involved pulling the MM fiber and power cable through a 1 1/4 inch EMT conduit to the roof. Some running back and forth, but not terrible work. I used the existing Ethernet cable for the management port. This will be left disconnected from the switch most of the time. The other side is mounted at about 85 feet AGL on a hot AM tower. I like the use of fiber here, even though the tower is skirted, the AM station runs 5,000 watts during the daytime. 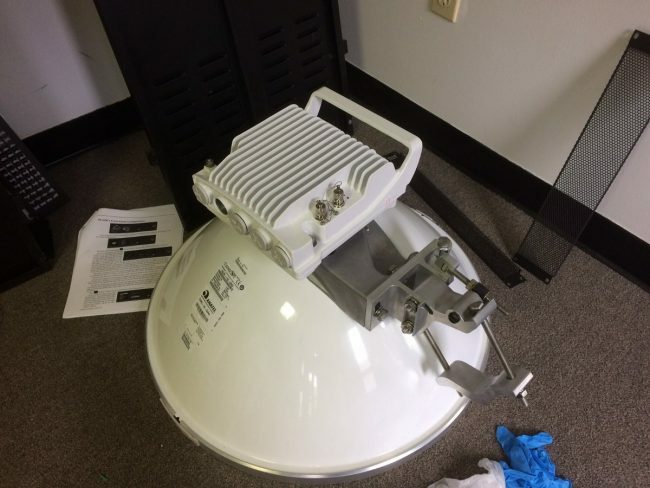 We made sure the power cables and Ethernet cables had lighting protectors at the top of the run near the dish and at the bottom of the tower as well as in the transmitter room rack. I know this tower gets struck by lightning often as it is the highest point around for miles. Aligning the two dishes was a degree of difficulty greater than the 5.8 GHz units. 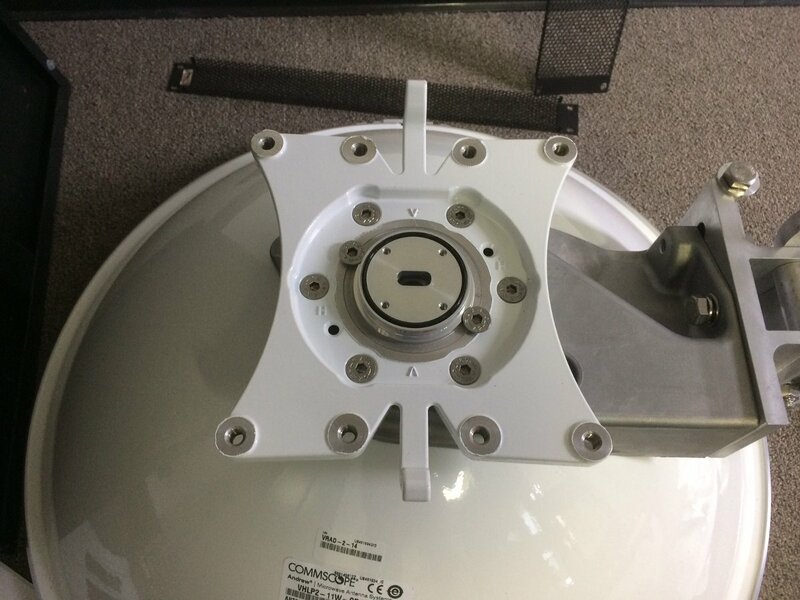 The path tolerances are very tight, so the dishes on each end needed to be adjusted in small increments until the best signal level was achieved. The tower crew was experienced with this and they started by panning the dish to the side until the first side lobe was found. This ensured that the dish was on the main lobe and we were not chasing our tails. In the end we achieved a -38 dBm RSL, the path predicted RSL was -36 dBm so close enough. This means the system has a 25 dB fade margin, which should be more than adequate. While were were aligning the transmitter site dish, a brief snow squall blew through causing a white out and the signal to drop by about 2 dB. It was kind of cool seeing this happen in real time, however, strangely enough, the tower crew was not impressed by this at all. Odd fellows, those are. Currently brushing up on FCC part 101 rules, part C and H. It is always good to know the regulatory requirements of any system I am responsible for. As AOIP equipment becomes more main stream, I see many of these type installations happening for various clients.